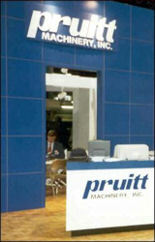 Pruitt Machinery's service department operates from a 6,000 square-foot building with a fully equipped machine shop. The shop is sub-divided into individual workstations or service bays set-up with multiple voltage power services, allowing our technicians the ability to work on numerous machines of any voltage simultaneously. The shop set-up provides us the capability of demonstrating machines under power for final customer approval. The shop is equipped with metal machining and fabrication equipment, clean-up and restoration equipment, a large inventory of hand, hydraulic and pneumatic power tools, an inventory of spare parts, archives of machine manuals, a fleet of trucks, trailers, and tow-motors, and all the additional equipment required to service and rebuild woodworking machinery. Our service technicians have years of experience repairing, rebuilding, and servicing all types of woodworking machines and travel domestically as well as abroad installing, training, and servicing equipment. We service and rebuild our machines to customer specifications, from "cleaned and checked" to completely rebuilt with warranty. The Pruitt Machinery service department is 100% committed to full customer satisfaction. Our Guarantee: In the event that a machine's condition is not as represented, Pruitt Machinery will correct the problem at our cost, or if not feasible, will take the machine back and refund the customer the original purchase price of the machine. The machine is generally a nonfunctional machine that is need of repair and may be considered infeasible for repair. Could have missing, broken, worn and/or outdated parts. The machine is offered �As is - where is� with no warranty. The machine is purchased �As is� with nothing implied or warranted. The overall operating condition of the machine is generally unknown. The immediate working history of the machine is generally known and disclosed accordingly. Nothing is implied or warranted other than the general known history. The machine is cleaned, powered up, inspected, and checked for functionality. The required machine connections are made to determine the range and functionality of individual adjustments and the overall working condition of the machine is determined. The overall condition of the machine and its working parts are disclosed accordingly. The machine is cleaned, powered up, inspected, and checked for functionality. Items found to impede the machine�s working condition and/or functionality are repaired. An �In working condition� machine is offered with a limited 30 day warranty that covers major functional components. The machine is cleaned, powered up, inspected, and checked for functionality. Items found to impede the machine�s working condition and/or functionality are repaired and worn and/or broken parts are replaced as required. The machine is repainted or �touched up� as needed. Reconditioned machines are warranted for 30 days. The machine is disassembled and reconditioned from top to bottom. Broken, routine maintenance, and general wear parts are replaced with new parts. The machine is painted in the disassembled state, to reflect, as close as possible, the appearance of a new machine. The machine is reassembled and the operation of the machine is thoroughly checked and adjusted accordingly. A rebuilt machine is warranted for 90 days including any additional manufacturer�s warranties that may apply for replacement parts.